If you thought tattoo sleeves were a bit OTT then these next temporary tattoos maybe for you. Want to be cool like a pirate and still show off how cool you are as a geek? Then it’s time for you to lick, stick, and peel. Well, actually, you don’t lick these – you gently wet them. But in about 30 seconds, you’ll have a beautiful tattoo emblazoned on your flesh. Everything from retro joysticks to binary numbers to hearts showing your love for caffeine and coding. 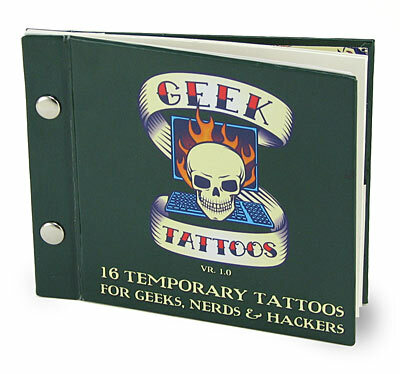 You can buy a book of Geek tattoos from Think Geek for $7.99.